Kangaroo is a beautiful 36’ Halvorsen Standard Cruiser built in 1958. This luxury timber boat is available for self-drive boat hire in the pristine waterways of Pittwater, Cowan and Hawkesbury north of Sydney and sleeps up to 7 passengers. She is the only remaining Halvorsen 36’ cruiser in marine survey with the NSW Roads and Maritime Service and available for boat hire in Sydney. She is based in Newport (approximately 40 minutes drive north from the Sydney CBD) with excellent access to the stunning Pittwater, Broken Bay, Hawkesbury and Cowan waterways & the magnificent Ku-Ring-Gai Chase National Park. She retains her old world charm while offering her passengers modern creature comforts. Halvorsen Boats traces its roots to 1887 when Halvor Andersen, a farmer launched his first wooden craft near Arendal in the south of Norway. His son Lars followed in his father’s footsteps and became a boat builder. Lars and his family, including sons Harold and Carl, settled in Sydney in 1925. From 1925 through to 1980 the family enterprise built over 1,500 craft making the Halvorsen name an Australian byword for quality and style. After World War II the company acquired a lease at Bobbin Head located north of Sydney in the Ku-Ring-Gai Chase National Park. The family built a fleet of approximately 200 hire boats. This made the Halvorsen boat hire operation the world’s largest privately owned fleet of its time. The quality and integrity of the Halvorsen workmanship never varied. The standard of finish and fittings was unsurpassed; glistening teak, maple and mahogany paneling, French-polished interiors, custom made metalwork were all a cut above the rest. Kangaroo, a 36’ Standard Cruiser, was launched in November 1958 (job 1127) into the Halvorsen Boat Hire Fleet at Bobbin Head. These elegant 36’ cruisers, first launched in July 1948, were the amalgamation of many previous design concepts and were the second in the range of standard cruisers offered by Halvorsens. The first 19 were designed for private buyers. Ten 36s were on the hire fleet with “Tooronga” launched in April 1957 being the first. Others included “Enterprise”, “Peer Gynt”, “Miramar” and “White Heather”. Kangaroo was sold off the Halvorsen fleet into private ownership in 1991. Since that time she has undergone major restoration and refit including upgrading to current NSW maritime survey requirements. Joe Leffers and his partner Di Quilty, along with offspring Alex & Mitchell, bought Kangaroo off the Halvorsen hire fleet in 1991. They had the pick of the Bobbin Head fleet and Kangaroo caught their eye. She then sat in the slips for the next 9 months, while their shipwright, John ‘Freebie’ Freebourne worked on her hull. Di recounts many memorable voyages before they sold her in 1997 when the family moved to Queensland. For the next 18 years, from 1997 to 2015, Kangaroo was a much-loved and integral member of the Burling family in the Pittwater area. For Paul & Yvonne Burling, their family and friends, Kangaroo was a second home. She was put to mostly private use but kept in maritime survey for occasional boat hire, including her “Home & Away” appearances, as the well-known character Alf Stewart’s boat, “The Blaxland”. In 2015, Michele & Mark Jobbins had the good fortune to take over the custodianship of this beautiful vessel. They now realise how incredibly naive they were when they undertook this responsibility. In some ways, they’re glad they didn’t fully appreciate the commitment they were making, since it may have caused them to hesitate or perhaps even forego the opportunity. As it has turned out, Kangaroo has enriched their lives beyond their imagining and they are delighted to share her with those who hold her in similar regard. As far as we are aware, Kangaroo is the only Halvorsen 36’ Standard Cruiser that remains in marine survey with the NSW Roads and Maritime Service and available for boat hire in NSW. 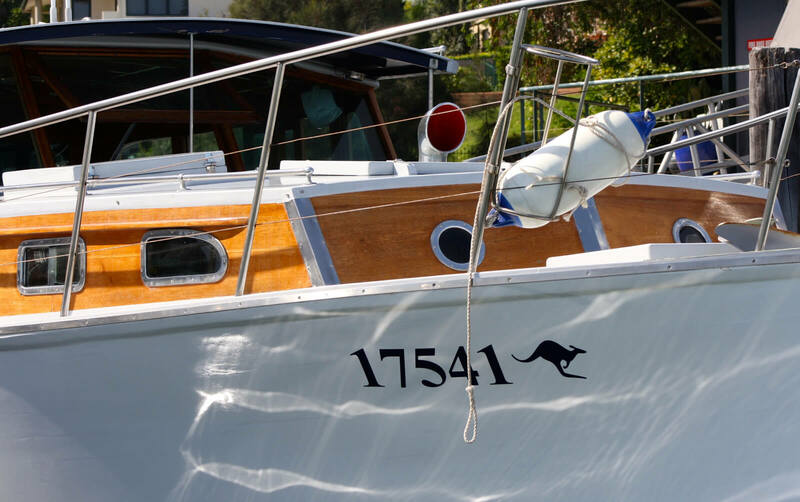 Since her first appearance in late 1998-early 1999, Kangaroo has moonlighted as a cast member of the long-running and internationally popular TV series “Home and Away”, appearing as “The Blaxland”, the boat owned by the popular character Alf Stewart (played by Ray Meagher). She has been involved in many dramatic storylines and some landmark celebrations over the years. She was thought to have sunk at one stage but we can assure you that this was purely poetic licence. During their 1976 Australian tour, ABBA took time out to cruise Cowan Creek aboard Kangaroo and record footage for the music video ‘Tropical Loveland’. Being such a distinctive and distinguished vessel, Kangaroo has been employed in a variety of commercial enterprises over the years and we often only learn about these when others in the know contact us to share an unrecorded aspect of her history. Please contact us if you know something about her that we don’t!